Maybe you know by now that smoking is not good for your health, despite the perks that advertising constantly promises to those who light up. So you don’t smoke—great! But many of us have friends that do, and this can be a problem. Secondhand smoke is just as full of harmful-chemicals as firsthand smoke. In fact, when you breathe in secondhand smoke, it could be even more potent than sucking on a “cancer-stick” yourself. This irony is mainly due to the fact that cigarettes have filters, whereas secondhand smoke enters the lungs unfiltered. 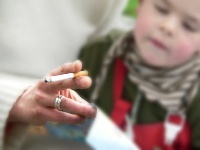 If you have grandkids, you’ll want to be particularly careful about secondhand smoke. With kids around, smoke-free is definitely the way to go! Researchers from the Department of Primary Care and Public Health, ImperialCollege, London, bear this out with some solid, scientific evidence. RECOMMENDED: For help with smoking-cessation. In recent health news, the U.K. researchers just finished assessing whether the implementation of smoke-free legislation in July 2007 was associated with a reduction in hospital admissions for childhood asthma. Before the legislation was passed, the admission rate for childhood asthma was increasing by 2.2% per year. After the legislation, there was a significant and immediate change in the admission rate of -8.9%. On average, admissions to hospital due to asthma attacks dropped 3.4% per year. To give you some perspective, this means that there were 6,802 fewer hospital admissions in the first three years after implementation of the smoke-free program. That’s over 6,000 kids that didn’t have to rush to the emergency room with life-threatening breathing problems. Millett, C., et al., “Hospital Admissions for Childhood Asthma after Smoke-Free Legislation in England,” Pediatrics January 21, 2013.